With a near-infinite range of styles and materials, earrings are the most imaginative, sculptural and individual element of your jewellery. 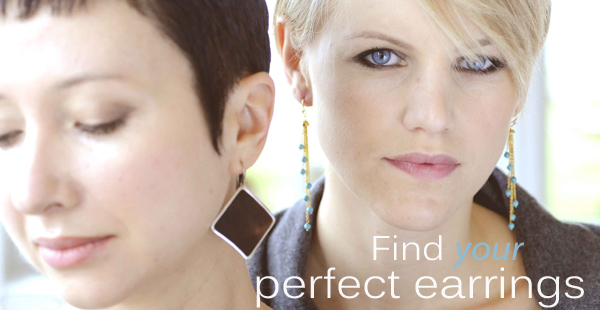 Close proximity to your face makes the choice of earrings important and personal. But how do you choose earrings that are perfect for you? Did you know that earrings highlight your eye colour? Here are some tips for selecting different gemstones. If your eyes are grey or blue, then earrings with lapis lazuli, kyanite, blue topaz, turquoise & aquamarine will all look wonderful and will bring out the blue in one’s eyes. Brown eyed girls might be surprised to learn that the principle works to their advantage! Gorgeous stones like citrine, ruby, smoky quartz, carnelian & garnet will all add a sultry understated richness. And a pair of earrings created from chocolate brown mother-of-pearl is a sensational eveningwear essential. Malachite, jade and peridot earrings all beautifully enhance green eyes with the stronger colours ideal for you green-eyed red-heads! Green gemstones also work for hazel eyes but our personal favourite for green or hazel eyes (and it looks fab on brown eyes too!) is abalone shell for its iridescence and beauty, especially in the sunshine. We also love amethyst! A gemstone well known to suit those with green or brown eyes but when worn by any woman it never fails to add elegance and glamour. Pearls are, of course, suitable for all. They are famous for reflecting a flattering, soft light onto one’s face and have now come back firmly into vogue. A variation to consider would be black or peacock pearls whose colour actually scintillates grey, pink and purple. White or ivory mother-of-pearl may well provide your biggest surprise, suiting all women and providing elegance, freshness and cutting-edge style through some stunning modern designs. These tips will help you choose colours and gemstones but the most important rule is to choose earrings that make you feel special.